Yellowstone has been a national park since 1872, but it was only in the 1960s that scientists realized the scale of the volcano — it’s 44 miles across — and not until the 1980s did they grasp that this thing is fully alive and still threatens to erupt catastrophically. Yellowstone is capable of eruptions thousands of times more violent than the Mount St. Helens eruption of 1980. The northern Rockies would be buried in multiple feet of ash. Ash would rain on almost everyone in the United States. It’d be a bad day. Thus geologists are eager to understand what, exactly, is happening below all those volcano-fueled hot springs and geysers. These two magma chambers are stacked, and they are separated by a layer (called a “sill,” like a window sill) of non-melted rock. The magma rising from Earth’s mantle flows easily and doesn’t hold much gas. It cools and solidifies as it collides with relatively cold crust, forming the sill, the top of which is about six miles below the surface. On top of the sill is the upper magma chamber, with thick, sticky magma that holds a great deal of gas — which makes the magma in the upper chamber explosive. It’s like an unopened can of soda that has been shaken. The new study bolsters earlier research on the dual magma chambers. It used sensors arrayed around Yellowstone to record the speed at which seismic waves from small earthquakes pass through the subsurface rock. Such waves move more slowly through hot and/or partially melted rock formations. That data gave scientists the equivalent of an MRI showing the two magma chambers. “Supervolcano,” we should note, is not a technical term. The experts refer to Yellowstone as a “caldera” or a “caldera-forming volcano.” Some volcanoes form conical mountains. A caldera is a volcano that creates a vast crater. These are mountain-swallowing events. Visitors to Yellowstone are given a map showing the outline of the most recent caldera, and if they go to the right vantage point, it’s possible to see that the heart of the park is remarkably free of mountains. They were either blown away or fell into the big hole. The Yellowstone region has seen three big eruptions, the first one 2.1 million years ago, the most recent 630,000 years ago. Contrary to Internet rumor-mongering, as well as conspiracy theories about government coverups, there’s no sign that a fourth cataclysmic event is about to happen. It’s possible, in fact, that Yellowstone is getting a bit old and tired. It may be ready for a long nap rather than a major eruption. 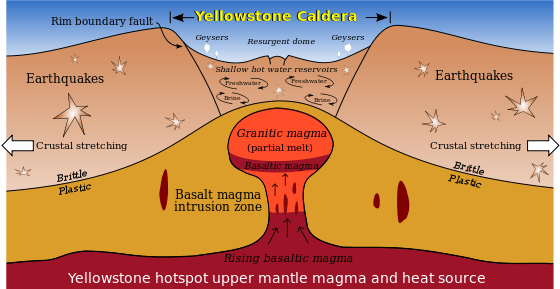 Yellowstone, it should be noted, isn’t the only caldera in the United States. One of the others that’s worth keeping an eye on — and the U.S. Geological Survey does just that — is the Long Valley caldera in California, near the popular ski resort of Mammoth Mountain, just east of Yosemite National Park. It erupted 700,000 years ago. A major eruption is extremely unlikely, but it could produce smaller eruptions that would be highly disruptive and dangerous, said Margaret Mangan, scientist-in-charge at the USGS California Volcano Observatory. But Californians don’t worry about volcanoes. They worry about earthquakes, tsunamis and wildfires, she said. She has tried to raise public awareness of volcano hazards but says that it is hard to get much attention. The University of Oregon (also referred to as UO, U of O or Oregon) is a public flagship research university in Eugene, Oregon. Founded in 1876, the institution’s 295-acre campus is along the Willamette River. Since July 2014, UO has been governed by the Board of Trustees of the University of Oregon. The university has a Carnegie Classification of “highest research activity” and has 19 research centers and institutes. UO was admitted to the Association of American Universities in 1969. Computer simulations suggest that a core-deep plume of magma isn’t needed to power the massive eruptions. 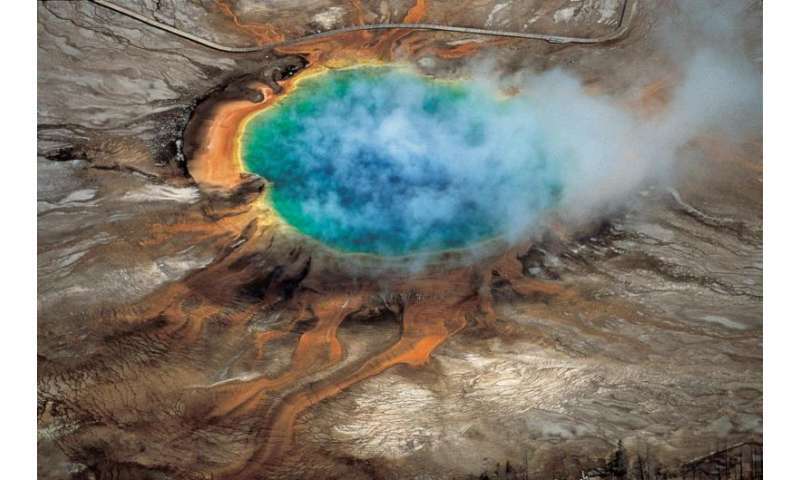 HOT SPOT The Yellowstone supervolcano has a 17-million-year history of eruptions in the western United States. Now scientists say the source of the supervolcano’s heat isn’t a deep mantle plume, but the downward drag of an ancient subducting slab stirring up the mantle. Riishede/iStockphoto. The giant supervolcano now beneath Yellowstone National Park, located mostly in Wyoming, has a 17-million-year history — much of it on the move. In that time, the locus of volcanism has moved northeastward from southwestern Idaho to its current location, where it most recently explosively erupted about 640,000 years ago. These shifting eruptions have created a track of volcanic craters resembling those created by the hot spot that formed the Hawaiian island chain. As a result, scientists have long suspected that a deep plume of magma originating from the core-mantle boundary, similar to the one that fuels Hawaii’s volcanoes, is the source of Yellowstone’s fury. But the nature of the Yellowstone plume has been the subject of debate. “Usually with plumes, we can trace them to the core-mantle boundary,” says Robert Porritt, a seismologist at the University of Texas at Austin, who was not involved in the new work. To “see” Earth’s structure, seismologists use a technique called seismic tomography, which maps the interior using seismic waves generated by earthquakes. Particularly hot or liquid parts of the mantle slow some seismic waves known as shear waves. Tomographic images of mantle plumes such as the one beneath Hawaii show a low-velocity region that extends all the way down to the boundary between mantle and core, about 2,900 kilometers below Earth’s surface. Such deep plumes are thought to be necessary to provide sufficient heat for the volcanism. “But at Yellowstone, we don’t have that large low-shear velocity thing at the core-mantle boundary,” Porritt says. Current images suggest a region of low-velocity material extending at least 1,000 kilometers deep — but whether there is a deeper plume is uncertain. And the region is tectonically complex. About 200 million years ago, a tectonic plate to the west, known as the Farallon Plate, began to slide eastward beneath the North American Plate. The current Juan de Fuca Plate off the Pacific Northwest coast, one of the last remnants of the Farallon Plate, continues to slide beneath the western United States. 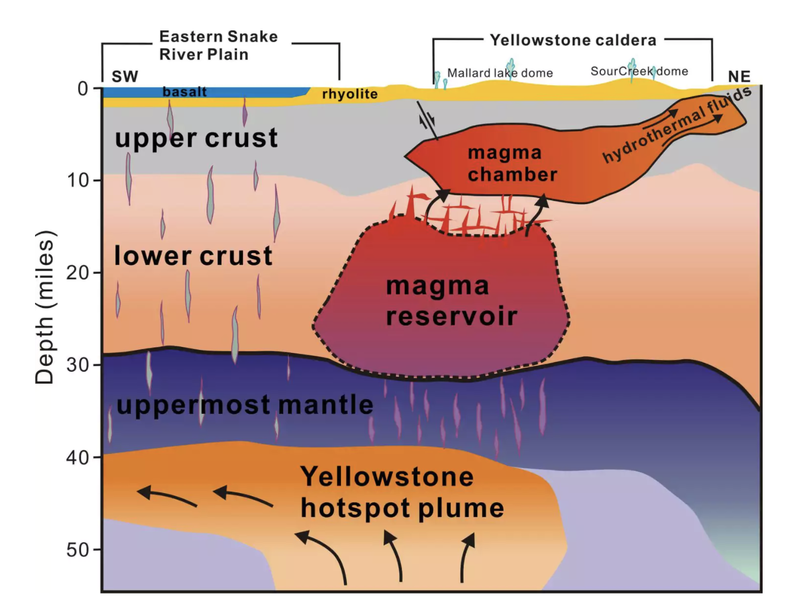 Some researchers have suggested that, instead of a deep mantle plume, the flexing and melting of the subducting Juan de Fuca Plate are responsible for Yellowstone’s volcanism. The Farallon Plate began subducting eastward beneath the North American Plate hundreds of millions of years ago. The youngest part of the slab, called the Juan de Fuca Plate (green), now partly lies beneath the western United States. In a new study, simulations suggest that the downward pull of the ancient Farallon Plate (blue) is driving the flow of hot mantle from west to east. As that hot mantle (dark orange) rises through breaks in the Juan de Fuca Plate, some of mantle circulates westward, fueling volcanism in the Basin and Range region. And some flows to the east, fueling Yellowstone. The researchers created a sophisticated, supercomputer-driven series of simulations to try to find the best scenario that matches the three known knowns: the current tomographic images of the subsurface beneath the western United States; the volcanic history at Yellowstone as well as in the nearby Basin and Range regions; and the movements of the subducting slab since about 20 million years ago. Yellowstone’s volcanism is linked not just to the currently subducting young Juan de Fuca Plate, but also to the remnants of its older incarnation, the Farallon Plate, the simulations suggest. Those remnants have continued to slide deeper and now lie beneath the eastern United States. This downward dive dragged hot mantle eastward along with it. As the Juan de Fuca Plate began to break up beneath the western United States, the hot mantle rose through the cracks. Some of that hot mantle circulated back to the west across the top of the Juan de Fuca Plate, fueling volcanism in the Basin and Range region. And some of it flowed eastward, adding heat to Yellowstone’s fire. The study doesn’t rule out the presence of a deep magma plume, but it suggests that such a plume plays little role in Yellowstone’s volcanism. Some 630,000 years ago, the supervolcano beneath Yellowstone National Park in Wyoming recorded its last catastrophic eruption, forming a caldera that nearly spans the park’s width and belching a thick layer of ash, or tephra, across North America. But rather than a single event, Yellowstone may have erupted twice in a span of 270 years, new evidence from mud cores discovered off the coast of Santa Barbara, California, indicates. The cores, presented here today at the annual meeting of the Geological Society of America, were captured at the farthest extent of the ash’s reach, recorded as wisps of tephra in finely sedimented, ancient mud uplifted near the ocean floor. Most evidence of the Yellowstone eruption (the park’s Grand Prismatic geyser is pictured) is found on land in thick layers of compacted, weathered rock, which could have easily hidden the dual eruption, the researchers say. Both tephra layers also coincide with a stark temperature decline of 3°C, according to the core’s records of oxygen isotopes and fossilized plankton, with each episode lasting 100 years or more. If confirmed, the research could indicate that Yellowstone can recharge its eruptions much more quickly than typically thought—and that traditional views of volcanic winter, the period of cooling caused by a volcano’s reflective droplets and ash, fail to explain how a century of cooling could follow the eruptions. 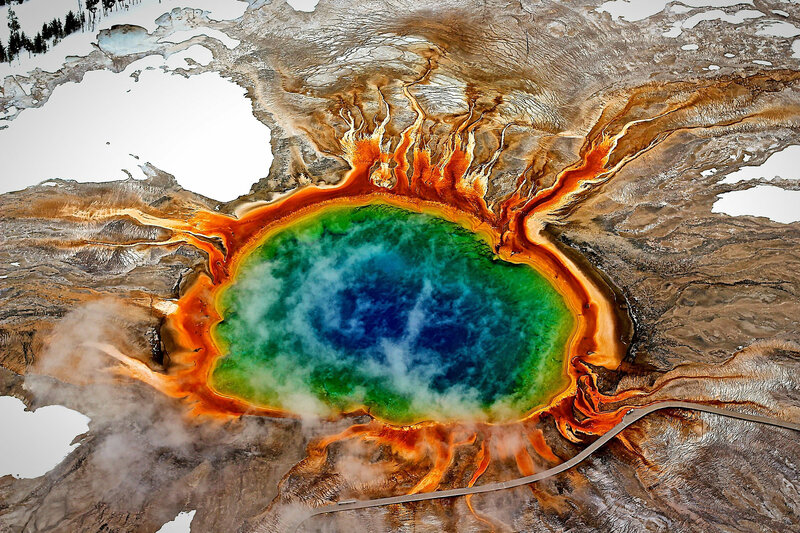 The Grand Prismatic Spring in Yellowstone National Park, a large hot spring known for its vibrant coloration. Beneath the park is a powerful supervolcano which drives the spring and other geological activity. Credit Marie-Louise Mandl/EyeEm, via Getty Images. Beneath Yellowstone National Park lies a supervolcano, a behemoth far more powerful than your average volcano. It has the ability to expel more than 1,000 cubic kilometers of rock and ash at once — 2,500 times more material than erupted from Mount St. Helens in 1980, which killed 57 people. That could blanket most of the United States in a thick layer of ash and even plunge the Earth into a volcanic winter. Kari Cooper, a geochemist at the University of California, Davis who was not involved in the research, said Ms. Shamloo and Dr. Till’s research offered more insights into the time frames of supereruptions, although she is not yet convinced that scientists can pin down the precise trigger of the last Yellowstone event. Geologists must now figure out what kick-starts the rapid movements leading up to supereruptions. Although fears of a Yellowstone volcanic blast go viral every few years, there are better things to worry about than a catastrophic supereruption exploding from the bowels of Yellowstone National Park. Scientists at the U.S. Geological Survey’s (USGS) Yellowstone Volcano Observatory always pooh-pooh these worrisome memes, but that doesn’t mean researchers are ignoring the possible consequences of a supereruption. Along with forecasting the damage, scientists constantly monitor the region for signs of molten rock tunneling underground. Scientists scrutinize past supereruptions, as well as smaller volcanic blasts, to predict what would happen if the Yellowstone Volcano did blow. Here’s a deeper look at whether Yellowstone’s volcano would fire up a global catastrophe. Probing Yellowstone’s past Most of Yellowstone National Park sits inside three overlapping calderas. The shallow, bowl-shaped depressions formed when an underground magma chamber erupted at Yellowstone. Each time, so much material spewed out that the ground collapsed downward, creating a caldera. The massive blasts struck 2.1 million, 1.3 million and 640,000 years ago. These past eruptions serve as clues to understanding what would happen if there was another Yellowstone megaexplosion. If a future supereruption resembles its predecessors, then flowing lava won’t be much of a threat. The older Yellowstone lava flows never traveled much farther than the park boundaries, according to the USGS. For volcanologists, the biggest worry is wind-flung ash. Imagine a circle about 500 miles (800 kilometers) across surrounding Yellowstone; studies suggest the region inside this circle might see more than 4 inches (10 centimeters) of ash on the ground, scientists reported* Aug. 27, 2014, in the journal Geochemistry, Geophysics, Geosystems. The ash would be pretty devastating for the United States, scientists predict. The fallout would include short-term destruction of Midwest agriculture, and rivers and streams would be clogged by gray muck. People living in the Pacific Northwest might also be choking on Yellowstone’s fallout. “People who live upwind from eruptions need to be concerned about the big ones,” said Larry Mastin, a USGS volcanologist and lead author of the 2014 ash study. Big eruptions often spawn giant umbrella clouds that push ash upwind across half the continent, Mastin said. These clouds get their name because the broad, flat cloud hovering over the volcano resembles an umbrella. “An umbrella cloud fundamentally changes how ash is distributed,” Mastin said. But California and Florida, which grow most of the country’s fruits and vegetables, would see only a dusting of ash. A smelly climate shift. Yellowstone Volcano’s next supereruption is likely to spew vast quantities of gases such as sulfur dioxide, which forms a sulfur aerosol that absorbs sunlight and reflects some of it back to space. The resulting climate cooling could last up to a decade. The temporary climate shift could alter rainfall patterns, and, along with severe frosts, cause widespread crop losses and famine. But a Yellowstone megablast would not wipe out life on Earth. There were no extinctions after its last three enormous eruptions, nor have other supereruptions triggered extinctions in the last few million years. “Are we all going to die if Yellowstone erupts? Almost certainly the answer is no,” said Jamie Farrell, a Yellowstone expert and assistant research professor at the University of Utah. “There have been quite a few supereruptions in the past couple million years, and we’re still around.” However, scientists agree there is still much to learn about the global effects of supereruptions. The problem is that these massive outbursts are rare, striking somewhere on Earth only once or twice every million years, one study found. “We know from the geologic evidence that these were huge eruptions, but most of them occurred long enough in the past that we don’t have much detail on what their consequences were,” Mastin said. “These events have been so infrequent that our advice has been not to worry about it.” A far more likely damage scenario comes from the less predictable hazards — large earthquakes and hydrothermal blasts in the areas where tourists roam. “These pose a huge hazard and could have a huge impact on people,” Farrell said. Human civilization will surely survive a supereruption, so let’s bust another myth. There is no pool of molten rock churning beneath Yellowstone’s iconic geysers and mud pots. The Earth’s crust and mantle beneath Yellowstone are indeed hot, but they are mostly solid, with small pockets of molten rock scattered throughout, like water inside a sponge. About 9 percent of the hot blob is molten, and the rest is solid, scientists reported on May 15, 2015, in the journal Science. This magma chamber rests between 3 to 6 miles (5 to 10 km) beneath the park. Estimates vary, but a magma chamber may need to reach about 50 percent melt before molten rock collects and forces its way out. “It doesn’t look like at this point that the [Yellowstone] magma reservoir is ready for an eruption,” said Farrell, co-author of the 2015 study in the journal Science. How do researchers measure the magma? Seismic waves travel more slowly through hot or partially molten rock than they do through normal rock, so scientists can see where the magma is stored, and how much is there, by mapping out where seismic waves travel more slowly, Farrell said. The magma storage region is not growing in size, either, at least for as long as scientists have monitored the park’s underground. “It’s always been this size, it’s just we’re getting better at seeing it,” Farrell said. As with magma mapping, the science of forecasting volcanic eruptions is always improving. Most scientists think that magma buildup would be detectable for weeks, maybe years, preceding a major Yellowstone eruption. Warning signs would include distinctive earthquake swarms, gas emissions and rapid ground deformation. Someone who knows about these warning signals might look at the park today and think, “Whoa, something weird is going on!” Yellowstone is a living volcano, and there are always small earthquakes causing tremors, and gas seeping from the ground. The volcano even breathes — the ground surface swells and sinks as gases and fluids move around the volcanic “plumbing” system beneath the park. But the day-to-day shaking in the park does not portend doom. The Yellowstone Volcano Observatory has never seen warning signs of an impending eruption at the park, according to the USGS. 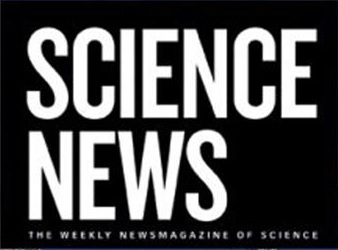 What are scientists looking for? For one, the distinctive earthquakes triggered by moving molten rock. Magma tunneling underground sets off seismic signals that are different from those generated by slipping fault lines. “We would see earthquakes moving in a pattern and getting shallower and shallower,” Farrell said. To learn about the earthquake patterns to look for, revisit the 2014 eruption of Bardarbunga Volcano in Iceland. Both amateurs and experts “watched” Bardarbunga’s magma rise underground by tracking earthquakes. The eventual surface breakthrough was almost immediately announced on Twitter and other social media. As with Iceland, all of Yellowstone’s seismic data is publicly available through the U.S. Geological Survey’s Yellowstone Volcano Observatory and the University of Utah. “We would have a good idea that magma is moving up into the shallow depths,” Farrell said. Neighborhood watch. A map of the worldwide distribution of supervolcanoes. The light reddish lines are subduction zones, the thick blue lines are mid-ocean ridges, and the size of the circles scales with the magnitude of supervolcanoes. Courtesy Lijun Liu. Liu and Leonard’s models, recently published in American Geophysical Union, simulated 40 million years of North American geological activity. By using the most well accepted history of surface plate motion and matching the complex mantle structure seen today with geophysical imaging techniques, Liu’s team imposed two powerful constraints to make sure their models didn’t deviate from reality. The models left little doubt that the flows of mantle beneath Yellowstone are actually modulated by moving plates rather than a single mantle plume. “Another thing more worrisome than global warming: Yellowstone super-volcano has 4x more magma than once thought”, from “Watts Up With That”, Alan Watts. 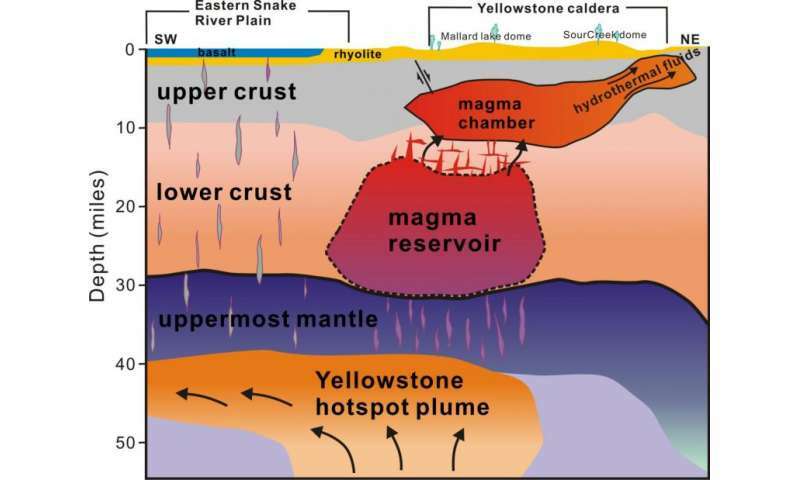 University of Utah seismologists discovered and made images of a reservoir of hot, partly molten rock 12 to 28 miles beneath the Yellowstone supervolcano, and it is 4.4 times larger than the shallower, long-known magma chamber. The study in Science is titled, The Yellowstone magmatic system from the mantle plume to the upper crust. Huang, Lin, Farrell and Smith conducted the research with Brandon Schmandt at the University of New Mexico and Victor Tsai at the California Institute of Technology. Funding came from the University of Utah, National Science Foundation, Brinson Foundation and William Carrico.